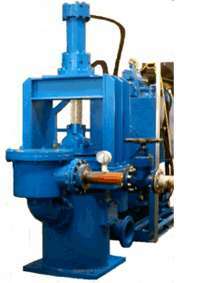 This is a ram type reciprocating piston pump that is driven by a separate electrically powered hydraulic power unit. 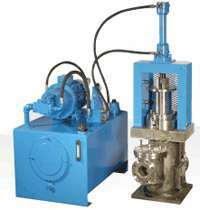 The pump and hydraulic power unit form a single integrated pump set. The pump is of robust, heavy-duty design and construction with an anticipated working life well in excess of 20 years with minimal maintenance, which gives cost effective handling of slurries. The pump can be used on filter press feed and sludge transfer applications giving a controlled constant flow or a diminishing flow with increased pressure. To obtain higher flow rates pumps can be installed as multiple units and controlled from a single hydraulic power pack. This style of pump was originally designed for the pumping of clay slip in the pottery industry but due to the pumping characteristics of the unit it has been used in many industrial applications. The hydraulic ram pump has the ability to vary from maximum flow at low pressure to a minimal flow at high pressure, which makes this one of the most ideal pumps to handle the feeding of slurries and effluent steams to a filter press. As the hydraulic supply to the pump is pressure compensated it ensures safe operation even on longer high-pressure cycles. The automatic pressure compensating also allows this pump to be used for transfer operation with low maintenance costs on long small bore pipelines where pressure increases can occur due to friction losses. The compensating characteristic of this pump ensures the system can be set at a pre determined pressure which will not be exceeded should blockages occur.